that there is a real need to adapt the techniques and the tools used when laying down tiles to make the job of the building professionals a little bit easier. technique (on occasions the “medium layer” technique). For this reason, it is necessary to use a notched trowel when applying the adhesive material. Normally, it is recommended to apply a double layer of adhesive mortar, however, if the tiles are going to be placed on walls the application of a double layer of mortar is essential.. Manipulation: Manipulation of tiles of great format is substantially improved by using DOUBLE or TRIPLE suction pads. Thanks to these tools, rectifying the position of the tile or checking the adhesiveness of the adhesive mortar is made a lot easier. Alignment and joints: With the exception of rectified tiles, large format tiles normally present small dimensional variations however this can easily be corrected by using spacers and “T”-shaped spacers in the joints. Levelling: Due to the large surface covered by each tile, the lack of level between tiles is a habitual problem when laying down this type of tile. In order to make this task easier RUBImanufactures the RUBITile Level, a new and quick levelling system, designed exclusively to be used when laying down large format tiles. The RUBITile Level allows the user to improve the levelling of the surface, avoid the movement of the tiles during hardening and make the process much quicker. Nowadays we can found the new Slim format porcelain tiles with 3 x 1 meters. 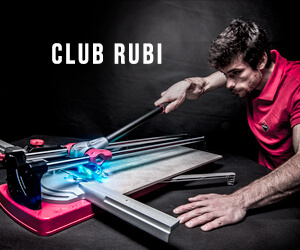 Rubi are ready for the market with the SLIM SYSTEM PROFESSIONAL CUTTER. A manual cutting system for large format porcelain tiles with thickness between 3 to 8 mm.